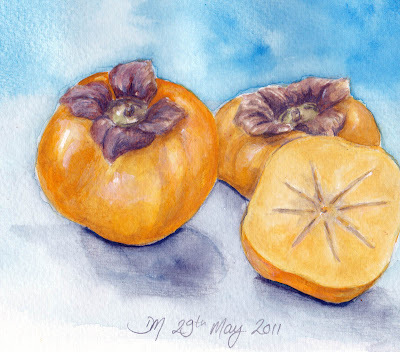 ......this and the pears done with new MaimeriBlu watercolours......but haven't had time to play yet. (Big boring cleaning day) At my shop they only had 12 or 45 so I'm testing them on the small 12 set to begin with. I have not seen yellow persimmons before-only red ones. Interesting. The drawing is perfect and the colors have been filled very neatly too.The orange is not too harsh or very subtle, sets perfectly with the light blue background. Thanks for your comments everyone! © All images on this site are protected by copyright law and may not be reproduced without my written consent.